Can we help consumers avoid running out of money in retirement? What are the most important factors to consider in order to minimise the risk of consumers’ pensions running out during retirement? 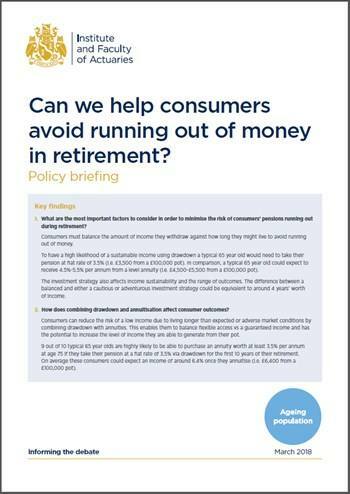 How could a combination of drawdown and annuitisation affect consumer outcomes? Consumers are increasingly accessing their DC pension pots, opting for drawdown products rather than annuities, and an increasingly large number of those consumers are purchasing drawdown products without regulated financial advice. As drawdown products do not offer a guarantee, it increases the risk of consumers running out of money in retirement. The two main factors to help provide a sustainable income are the age consumers start drawdown and the rate they withdrew their savings. A consumer who enters drawdown at age 65 has a high likelihood of generating sustainable income if they withdraw 3.5% per annum, or equivalent to £3,500 from a £100,000 pot. Comparatively, a consumer at age 65 could expect to receive around 4.5-5.5% of their pot per annum from an annuity as the annuity provider can pool risk among its consumers. This would be equivalent to £4,500 or £5,500 per annum. If an individual starts drawdown at age 55, then the sustainable level of annual income reduces from 3.5 - 3.0%, or equivalent to £3,000 from £3,500. The investment strategy of a consumers’ pension will affect their income sustainability and the range of outcomes. The difference between a balanced and either a cautious or adventurous investment strategy could be equivalent to 4 years’ worth income. How combining drawdown and annuitisation could affect consumer outcomes? A combination of annuities and drawdown enables consumers to balance flexible access vs guaranteed incomes. It can also lead to higher overall income. 9 out of 10 consumers taking £3,500 per annum via drawdown from age 65 to 75 could then expect to be able to buy a level annuity of more than £3,500 per annum at age 75. How much risk would I like to take? What is my current health status?